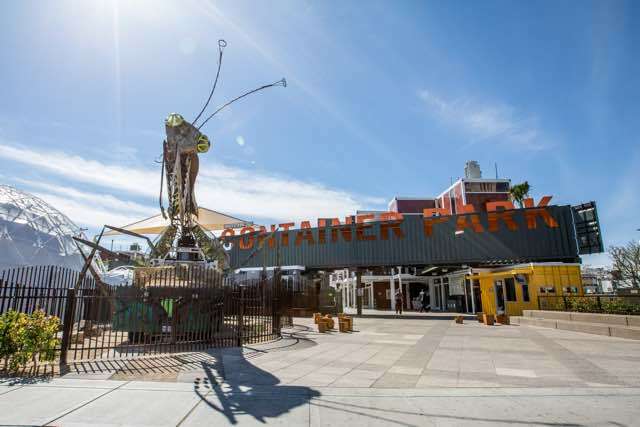 The Container Park, located Downtown, is an open-air shopping center built from repurposed shipping containers. 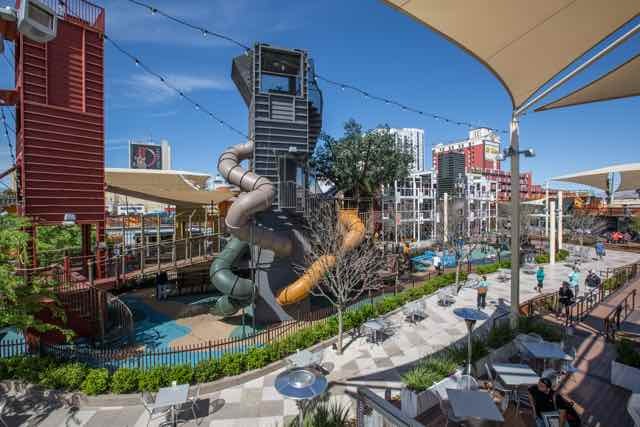 Located just a few blocks away from the Fremont Street Experience, this open-air shopping center filled with boutique retail shops, restaurants, and live entertainment. Marking the entrance is a 55-foot metal preying mantis sulpture which shoots flames during special evening occassions. Once inside the park you'll be surrounded by restaurants, bars, and retail outlets. The feature attraction for kids is the children's park. Located in mostly a shaded area (key for those hot summer months) the park contains a 33 foot tall slide sure to delight the advertureous child in your group as well as a NEOS playground, an electronic game that requires kids to chase after flashing lights. Also at the children's park are large foam blocks, sort of like giant sized Lego, for building, throwing and jumping on! There's a one-of-a-kind interactive play area where both children and adults can have fun and be active while exploring their creativity. Be sure to try SasaSweets Chillspot's one-of-a-kind frozen treats and Sweet Spot Candy Shop's vintage and classic candy. Children are not permitted after 9pm, even still, Downtown Las Vegas doesn't get much more family-friendly.